La Quinta Resort at the Adobe Grill and also where the appetizers are served and music plays! All of these restaurants allow dogs on their patio, but not inside. The only exception is for service dogs. 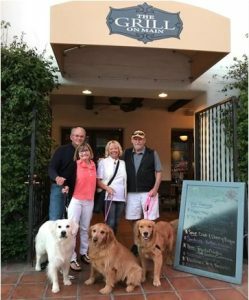 Do you have a friendly dog restaurant to share with us? Please connect with us on Facebook -Huston Group and share your picture there. Here we are at The Main Street Grill! It is in old town La Quinta!